As petrol gets more and more expensive, Auckland motorists have several things to blame for it – the slumping value of the Kiwi dollar, Donald Trump’s sanctions on Iranian oil, hurricanes in the Caribbean…But it is simpler and feels better to lay all the blame on the regional fuel tax, which oh yeah, got introduced to pay for ways to relieve Auckland’s road congestion, which everyone hates as much or even more than the fuel tax, right? Doing nothing wasn’t an option – or was only an option for the National government, which made an art form out of inertia. 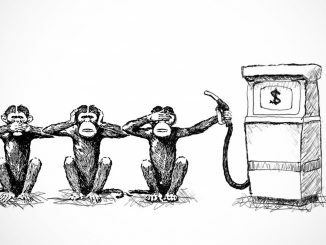 What’s up with the global price of oil? Unsurprisingly, there are several scenarios out there about where oil prices are headed. Most of them envisage the price going up – maybe even way up – over the next 18-24 months, starting about now. Only a few analysts say “down” and there’s a rapidly diminishing cluster of optimists who believe that oil prices will stick roughly around where we are right now. But why should we be blaming Trump for any of it? Because… on November 4th, US sanctions against Iran will remove between 1 to 2 billion barrels a day of Iranian oil from the global market, creating a scarcity likely to cause a sharp increase in oil prices. How big will this price spike be? The BBC is being told there’s a “real risk” the Iran sanctions could move the price for Brent Crude from the current $80 to $100 a barrel. Considering the low spare capacity for a quick ramp-up of production elsewhere, some hedge fund managers expect oil prices to jump to as high as $150 a barrel in 18 to 24 months. “Our view is that by November 4, we will have lost between 1.3 and 1.4 million barrels [of output] a day. It is a very big number. That’s based on the view that the U.S. will allow a few temporary exception waivers,” Jean-Louis Le Mee, CEO at London-based Westbeck hedge fund told Reuters. “Ultimately, we could see losses from Iran exceed 2 million barrels a day,” Le Mee said. As for global spare production capacity, it ranges between 2-3 mbd of which Saudi Arabia claims to have 2 mbd. However, the Saudi spare capacity is not one resulting from Saudi ability to ramp up production by 2 mbd above current levels but is merely dipping into its stored oil on tankers and on land. Once the stored oil is depleted, there will be no capacity whatsoever. The world could face an oil supply gap by 2020. There will be a need for 15 mbd of new oil to meet growing global ol demand and to offset an annual depletion rate estimated at 5% or 4.8 mbd, equivalent to the oil production of Iraq. Failing to provide new supplies of oil by 2020 could lead to oil prices surging far beyond $100 a barrel. Separately, the US Energy Information Administration said it forecasts domestic crude output to rise by 840,000 barrels a day to 11.5m b/d next year. This is lower than the just over 1m b/d rise to 11.7m b/d it had initially expected. The US shale boom has paved the way for production to reach more than 10m b/d but drilling in the Permian Basin in the south-western US, a key oil hub, has started to slow due to limited pipeline capacity for evacuating the oil. Oil market watchers have also been keeping an eye on impending US sanctions on Iran’s energy sector, which is expected to hit the country’s crude exports and could see the broader market facing a crunch. Saudi Arabia and its peers inside and outside of the Opec cartel are raising production more slowly than expected, also raising questions about available crude supply when the sanctions officially come into effect in November. So, while it is politically convenient to blame the regional fuel tax… given this looming situation of scarcity and rising oil prices, the regional fuel tax is going to be the least of our petrol price problems, over the coming months and years. And if it pays for measures that reduce congestion, the savings will come just in time. That’s MMP politics, not a crisis in governance. In other countries, the coalition dynamics of policy announcements leading to publically expressed disagreement leading to compromise are just political business as usual. In New Zealand though, given our conflict aversion and our timidity about expressing disagreement openly… goodness gracious, it gets treated as a calamity. Even so, while quibbling over the industrial relations reforms this week and posing as the best friend of small business, Regional Development Minister Shane Jones did choose a very unlikely firm to champion on RNZ: Basically, Jones asked us to consider the plight of JNL, aka Juken NZ, which is the Japanese owned multinational giant that has just cut 100 jobs in Gisborne (in response to diminishing demand in the Japanese housing market) and which is about to do much the same to the workforce at its board mill in Kaitaia. None of this has been a product of local union militancy. Moreover, the “threat” posed by multi-employer contracts is the least of the concerns for the workers in the firing line – but if Jones and NZF now want to go to bat for foreign multinationals who have been buying up our forests, then so be it. Even so, if NZF wants to market itself as being the champion of small business, maybe it should start by finding a small business to champion. A small point… you could think we were still living in the early 1990s, given how the decline in the value of the Kiwi dollar is invariably presented as great news for exporters, and thus great news for all of us, too. Well, it isn’t. It is also a socially regressive trend which leaves most of us paying more for things like petrol and other imports. It is great for foreign tourists – we’re increasingly a cheap location – but terrible for any New Zealander wishing to travel. A declining dollar also imports inflation, which we eventually pay for with higher interest rates. It also makes it harder to attract skilled foreigners, because our relatively low wages will now be worth even less, offshore. Finally, even our exporters will now need to pay more for the imported components required to make some of the things they export. So can we just can dial back the chirpy reportage for a while? Longer term… the sinking dollar against the greenback is also bad for business innovation. If exporters can get a free payday from a decline in our dollar – hey, do nothing and more money still rolls in – where is the motivation to find new ways to compete? Back when the dollar was higher, firms had to innovate to survive. Yet already, our business sector claims to feel “ pain” when the NZD sits at 70 cents against the greenback. It is now at 65 cents and headed south. Do we really need a 35% edge on the USD, and a 10% advantage over the Aussie dollar, in order to be able to compete? Unfortunately, it our captains of industry really do seem to need that kind of head start. If you felt so inclined, you could blame Trump for some of this as well. By triggering trade wars, dishing out lavish tax cuts, and causing the Federal Reserve to raise interest rates to put a brake on the subsequent inflationary pressures, the Us has sent investors flocking to the greenback, pushing it upwards and thereby creating massive instability in emerging markets – and those markets comprise half the global economy and have been the sites of much of its recent growth. In time, this process is bound to make US exports less price competitive – but when that happens, chances are it will only encourage Trump to become even more belligerent. A few hints of the art installation that accompanies the Mothe EP – apparently, you can remix the EP and collaborate with her in the process – can be accessed here. Youtube also has a fan video of the experience… And the video game interface can be glimpsed at her website here.